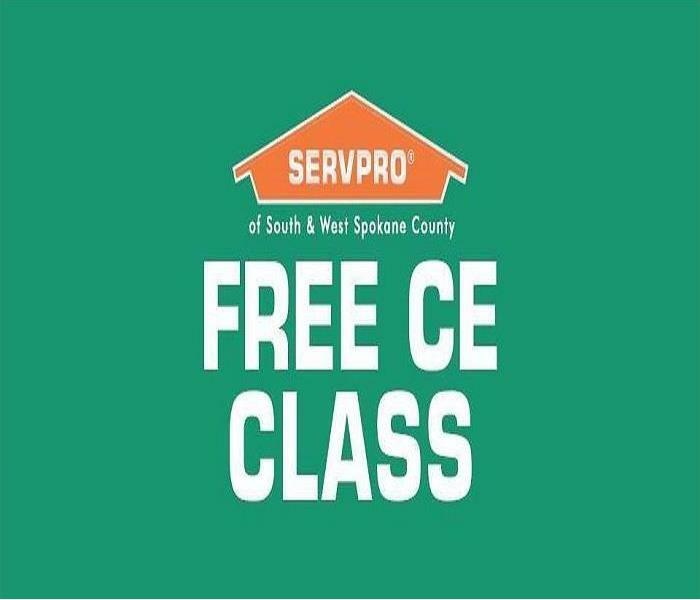 SERVPRO of South & West Spokane County is offering FREE Insurance CE Course's in Spokane on Thursday, September 6th 2018 – hosted on the north side of Spokane at the Quality Inn on North Division. Please RSVP as soon as possible as space is limited and we are filling up fast! We would love for all Spokane-area insurance agents to attend and please share this information with any other agents/agencies who you think may be interested. We fly our instructor in from our Corporate Tennessee office and he does an excellent job and teaches the class with humor and some hands-on learning that keeps you engaged! We also have fun giveaways for class attendees, leaving you with an opportunity to leave with something really cool! This is a once a year event so save your spot today by emailing jess@SERVPROnwspokane.com. Look closely.. the wallpaper looks as though it is in good shape. As it peeled away from the wall it revealed the scope of the mold problem. A home owner or business owner wants to get back to normal as soon as possible. Working to make that happen is our goal. That being said water damage or fire damage is never a pretty thing. The right expectations need to be understood. Beyond that what needs to be understood is the reason for the time frame and process. Let me explain. All too often especially with water damage issues we are asked to cease and desist. Pack up our stuff and leave before the work is done. There are even times that we recommend opening a wall, or pulling up the floor. Home owners and business owners will refuse to let us to do this sort of work. Why would they do that you ask. There are a number of reasons but the main one is that they do not want the inconvenience of more intrusion into their home. This is always a bad idea. Restoration companies have extensive training and certifications that most do not. They also have years of experience working with insurance companies and property adjusters. This leads to a great understanding of the scope of work that is needed to properly mitigate your building. This ensures what they call secondary damage is not an option. First let us get into what secondary damage actually is. Secondary damage is something that would not have happened even if the first occurred. Let me explain. If you do have a pipe break, you call and get the plumber out and stop the water. Moisture damage is what happens when you do not mitigate the water that intruded into your home fast enough. Some key examples of what is considered secondary damage is when your wood floors start to buckle. This is not from the water intrusion it is from the wood sitting in the water that is underneath . The wood warps. This warping forces the finish to crack and the floors are not salvage able. 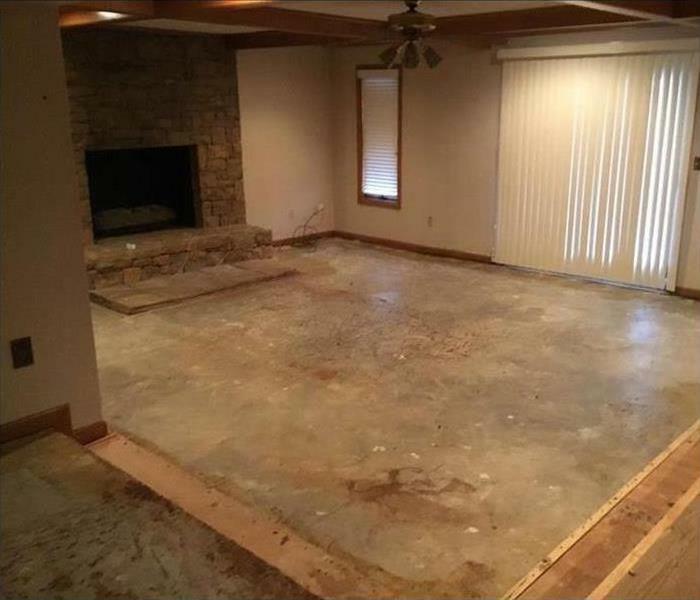 Ok, so you don’t have wood floors. Vinyl is not much better, look at that edging popping up. That is damage from the water getting under the floor and damaging the glue. Cracks in sheet rock and sagging ceiling are a result of moisture continuing to collect if they did not have an outlet to release the water. Mold colonization. This is probably the most problematic. The challenge here is many times it will be somewhere you cannot see until it is a real problem. Similar to an iceberg you only see a fraction what is there. Lurking behind a wall under a floor or even where you see nothing at all such as in a duct system. Let us get back to the reason for this post. We have clients that ask us to leave early and no explanation in the world is going to change their minds. Business owners are looking at the short term issue they have to be closed. Closing means so money is coming in and many do not have the proper insurance to cover loss of business. Additionally they tend to have very high deductibles or inadequate coverage. Coupled with lack of income there are a lot of bad decision made. They only want the visible water dried out. They will not allow demolition to occur for it will delay the process of reopening. Another problem is that they do not want to pay for anything more than absolutely necessary. Home owners often as us to leave early but not always for the same reasons as a business owner. The equipment that is used in the drying process is industrial. It is not like the fan you put on your night stand to lull you to sleep. These are high powered fans used to circulate the air and create a tornado like event that forces strong air movement. They are positioned in such a fashion that they are pointed at wet objects , such as a wall. This positioning is tied directly to where the dehumidifiers are located as well. This will force the air to push the moisture out of the wet materials into the air and the dehumidifier will capture the wet air and release it as drier air. This requires the area to be warm. We ask people to turn up their heat and the equipment itself gives off quite a bit. All too often the home owner will say the fans are too loud. They are too big and in the way. I have a party planned for this weekend. It is just too hot inside I cannot stand it anymore. All of these decisions are bad ideas. We have 3 different kinds of waivers that are required. One that states you know we do not advise removal of equipment. One that advises you are declining the scope of work we are recommending. There is also a limitation on standard compliance form when we are not allowed to perform the necessary scope of the work. We have to make sure when the mold appears down the road we are not held liable and the parties in question were explained the scope of possibilities for this refusal. We try to work with the residents of the property to the best of our ability. At the end of the day they are the ones affected and we will honor their wishes. You must know the potential ramifications for your actions and know that down the road be it 1 week, month, one year or even several years later. Mold can be a very serious problem. Kicking off a professional can be expensive. Now we agree not everyone may be doing the work up to par and that is your right to change whom it is that is doing the work. Have a plan in place to get it completed in a timely fashion. Do not kick them off totally without a solid replacement plan. 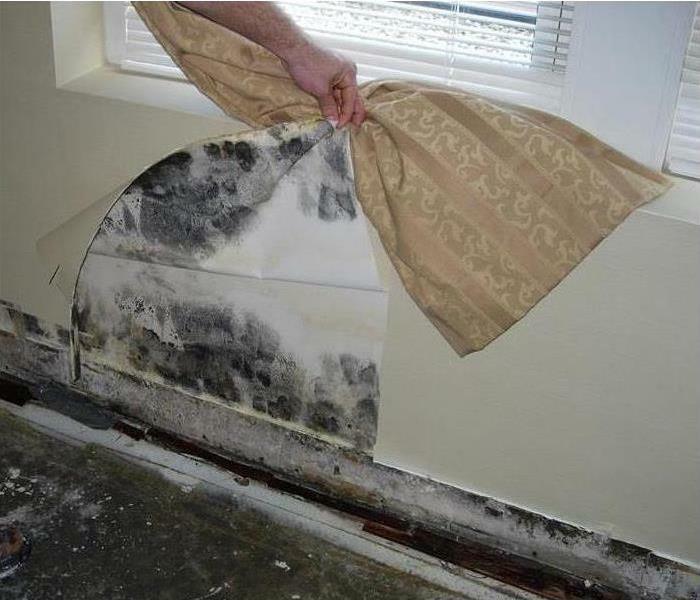 The cost associated with Mold Remediation far exceeds what a few days of inconvenience could ever be. So before you kick a remediation company off the job, think about what is going on and have a plan. Flooding and water damage events at Spokane-area commercial properties are often complex with numerous issues that require a knowledgeable and flexible response. Whether we’re dealing with a relatively small water cleanup scenario or a large scale event, we work quickly to assess each unique situation and isolate the damaged area. Many business owners understand that the business downtime can be more devastating to the property damage -- we understand that many times the most important thing to Spokane-area businesses is to get back in business . . . fast. 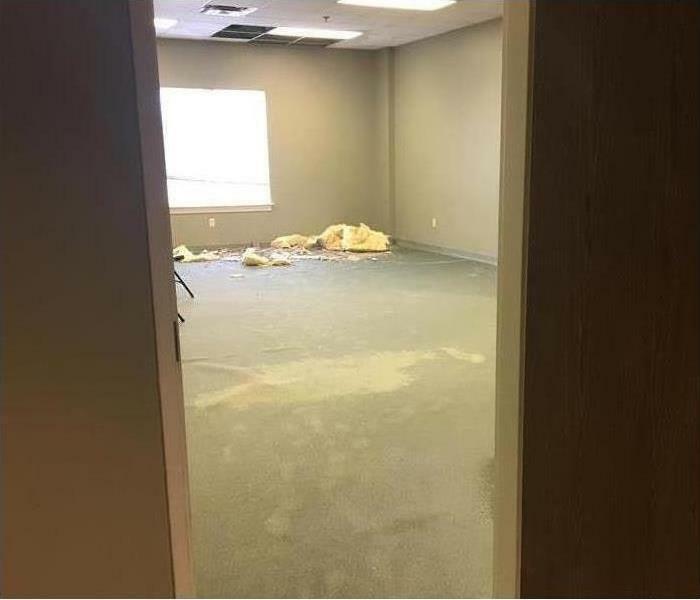 SERVPRO of South & West Spokane County specializes in the cleanup and restoration of commercial and residential property after a water damage event. Our staff is highly trained in property damage restoration. From initial and ongoing training at SERVPRO’s corporate training facility to regular IICRC-industry certification, rest assured our staff is equipped with the knowledge to restore your property. We can be reached at (509) 534-0566. Within one hour from notice of loss, SERVPRO of South & West Spokane County Professionals will contact you to arrange for service. You'll know help is on the way! Within four hours of loss notification, SERVPRO of South & West Spokane County Professionals will be on-site to start mitigation services. the key to reducing damage and saving money is responding quickly to your damage. 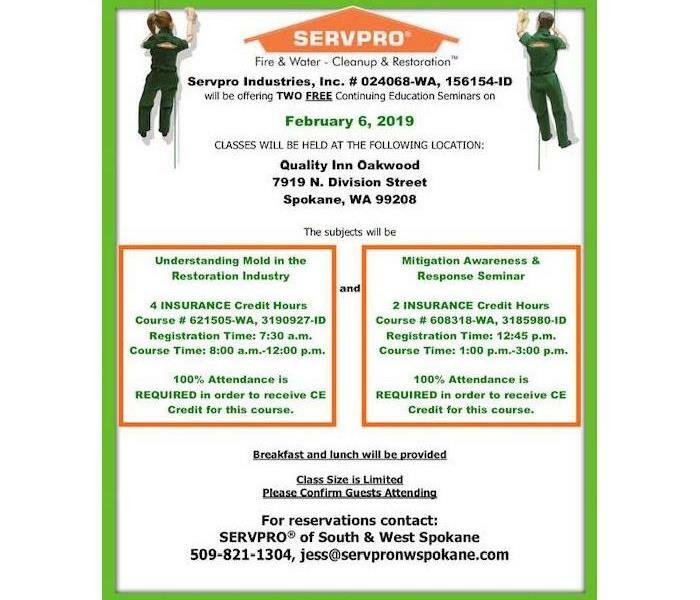 A trained, uniformed and equipped SERVPRO of South & West Spokane County Professional will walk through the job process step-by-step, explaining what to expect and the anticipated outcome. SERVPRO of South & West Spokane County Professionals will begin pretesting for restorability, working from the source of the damage outward. Within eight hours of on-site arrival, a verbal briefing of the scope will be communicated to the appropriate person, normally your adjuster or property manager. SERVPRO of South & West Spokane County Professionals will work neatly and efficiently to help to regain control of your property when a damaging event has taken over. They will use state-of-the-art restoration techniques to ensure your property is taken care of right the first time. After the work has been completed, a final walk-through will be conducted with you to help ensure your satisfaction. SERVPRO OF SOUTH & WEST SPOKANE COUNTY IS HERE TO HELP! IF YOU HAVE ANY QUESTIONS ABOUT WATER DAMAGE OR YOU THINK YOU MIGHT HAVE A WATER DAMAGE DO NOT HESITATE TO CALL US @ 509-534-0566! Sump pumps are headache savers when it comes to saving our basements from flooding whenever a downpour occurs. 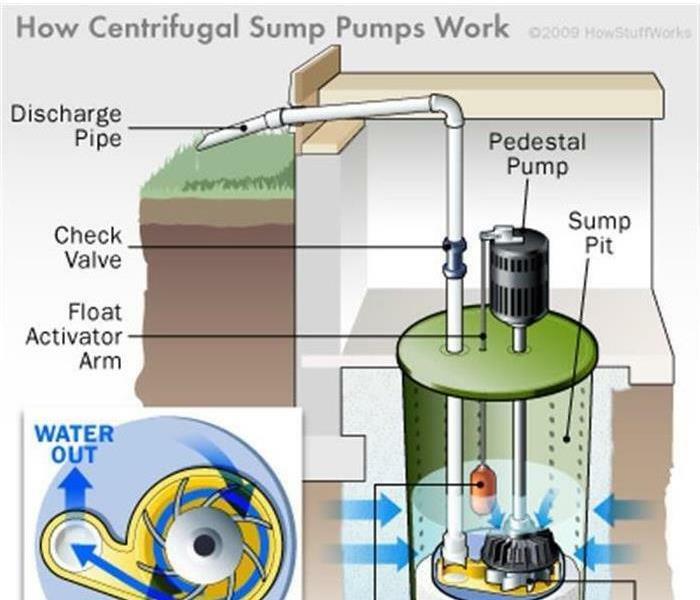 The sump pump sits in the lowest part of our basement or crawlspace and is automatically activated when it detects that there is water starting to fill up the hole it is sitting in. As the pump runs, it sends the water out of the discharge line and away from the home making sure that the home does not flood. Like any other mechanical device, sump pumps still have the possibility of failing. Power failure– The most common cause for failure of a sump pump is a power outage. As we know, most power outages happen when we need the sump pump most, during a storm. Purchasing a backup generator to keep your sump pump moving during a storm can save your home from a flooded basement. Improper installation– The installation of a sump pump is crucial to it working properly. One mistake or misstep in following the manufacturer instructions can lead to water to be displaced. Make sure to follow the manufacturer’s manual or consult a professional to make sure the sump pump is installed correctly. Frozen or clogged discharge line– The discharge line is where the water exits the home. It is important to make sure that the line is protected from freezing and does not have debris such as dirt, rocks and sticks. A grated discharge line will give water a separate way to flow in case of a blockage. Lack of maintenance – Manufacturers recommend testing and running the pump every 2-3 months. Switch problems – The purpose of the sump pump is to automatically turn on when a sensor notices that there is water build up. If the pump gets shifted and moves position inside of the basin, it can cause switch to be inaccurate and not know where the correct water level is, making the pump not switch on at the correct time. Manufacturer defect – Although it is rare to get a bad machine right out of the store, it still is possible. It is important to test the pump after installation to ensure that it is running properly so that you aren’t finding the defect when it is already too late. SERVPRO of South & West Spokane County is ready to deal with any size storm damage. When heavy rains and high winds hit hard, property destruction and loss can be devastating to you as a homeowner. 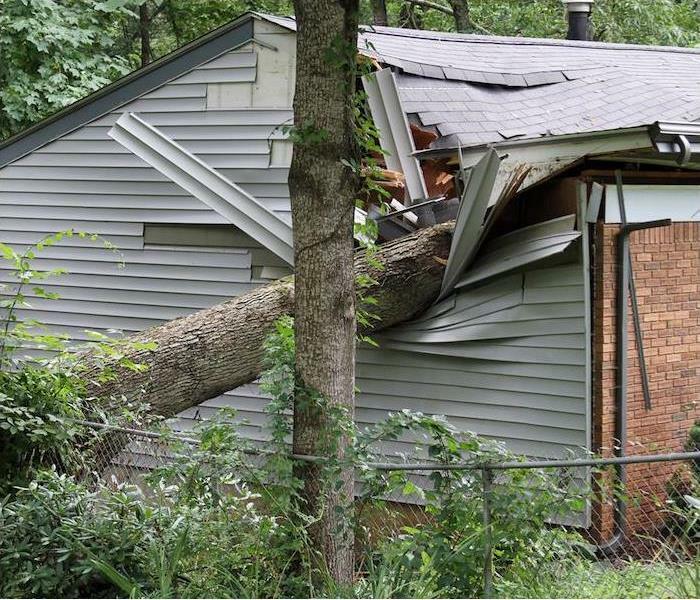 Structural damage to the exterior of your home is followed by interior devastation from water and winds. Storm damage is rarely isolated to just a few buildings in an area adding the challenge of finding a restoration company that can respond swiftly to your needs to an already anxiety provoking situation. SERVPRO of South & West Spokane County delivers the help you need swiftly even when a local disaster is widespread as we are able to call upon a network of over 1,650 franchises nationwide to respond if the need is great. Once you make sure that your family is safe after a major storm, your first call should be to SERVPRO of South & West Spokane County. 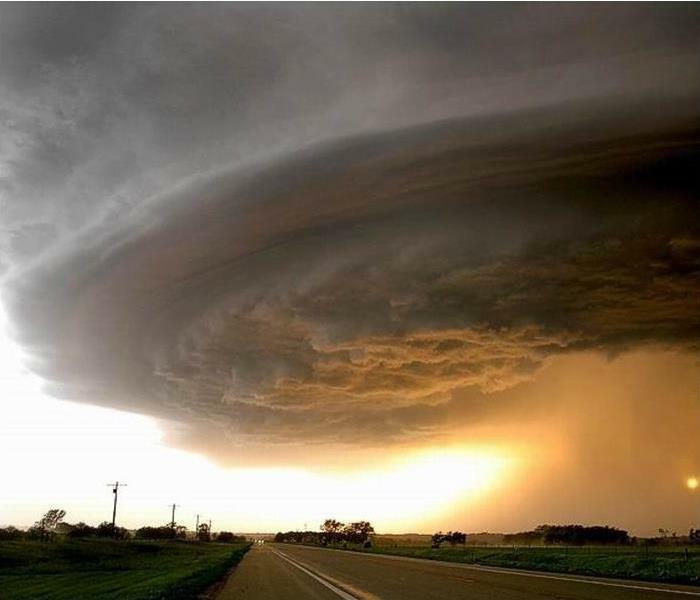 Dial (509) 534-0566 24/7 and begin the road to recovery by scheduling an inspection with our storm damage experts. SERVPRO Storm Teams Are Ready! 2017 Hurricane Irma: Extreme winds and abnormal amounts of flooding in Florida, South Carolina, Georgia & Puerto Rico. 2017 Hurricane Harvey: Caused extreme flooding in parts of Houston. Because it’s traumatic: No one should have to deal with the personal impact of cleaning up after the traumatic loss of a loved one. 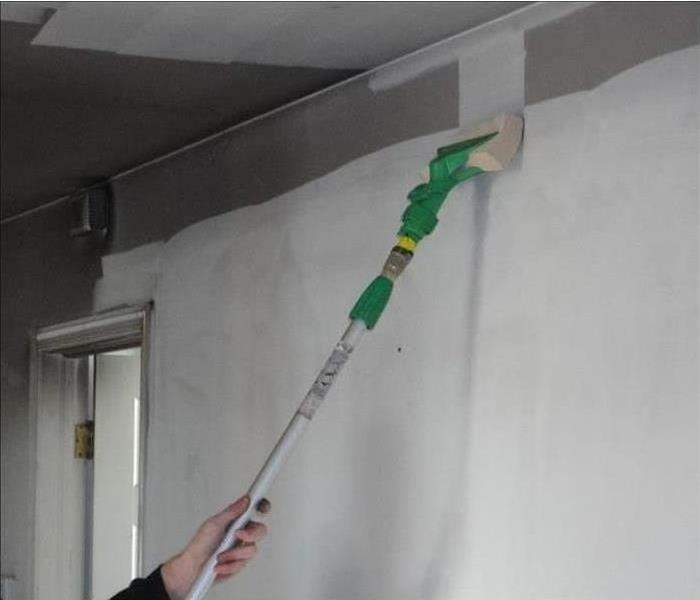 A SERVPRO professional can get a situation cleaned up quickly, compassionately and discreetly. Because it’s safer: Federal regulations classify all human and animal remains, including blood, urine, feces, vomit and bodily fluids, as biohazards. This is because they have the potential of carrying life-threatening pathogens such as Hepatitis B and C, AIDS, HIV, MRSA, Tuberculosis and many more. The safe cleanup and removal of biohazardous materials involves extensive analysis and detailed work, and the use of state-of-the-art cleaning and odor removal technologies. It is important to use licensed professionals because they conduct safe cleanup, removal and disposal of biohazardous waste. Additional considerations include being registered and compliant with OSHA and FEMA, federal agencies that oversee disasters and workplace safety. Cleanup crews will be coming into your home or the home of your loved one, so be sure the professional you choose is bonded and insured. In most cases, insurance will cover much or all of the cost of traumatic even cleanup. You can minimize or eliminate your out-of-pocket expenses by working with licensed and bonded professionals such as SERVPRO of South & West Spokane County who will deal directly with insurance companies, saving you one more headache in this already difficult process. Can I just use my regular cleaning or janitorial service for biohazard cleanup of blood or bodily fluids? 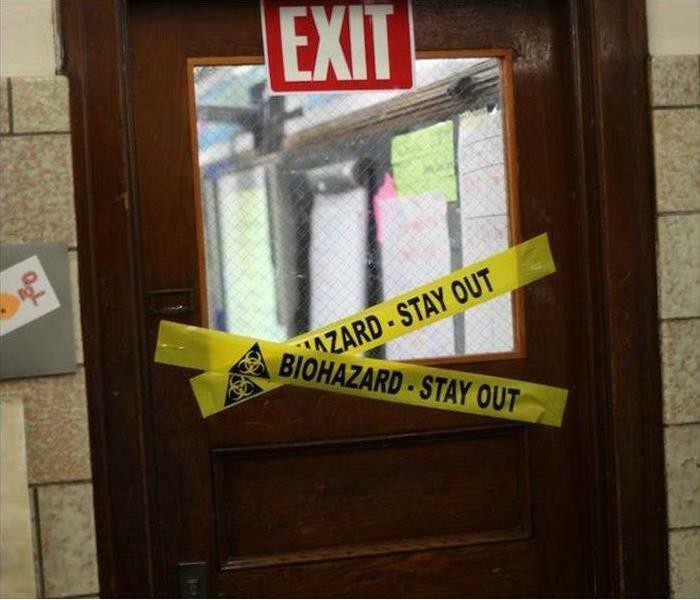 A: Not unless your regular cleaning or janitorial service has been properly trained and equipped to handle biohazard cleanup and waste such as blood or bodily fluids, and has a legal place to dispose of the recovered biohazardous waste. A: In many cases home, business or auto insurance will pay for bio-recovery services. Ultimately the property owner may be responsible for cost of the service. Having been offered Hepatitis B vaccine and exposure evaluation and follow-up. 4/3/2018 - SERVPRO Storm Teams Are Ready!